Although I almost always have a camera nearby, and manage to take a fair number of pictures, it is very seldom that one like this presents itself. This is, you have to know - this is my dream shot! This is what I live for in photography! This picture is completely from a by-gone era, and yet, I just shot it last week. The stars almost never align for me this perfectly! It was mid-morning, on Bridge St. in Sackville, and I had my EOS 650 (film, not to be confused with the Rebel T4i, which is also called the EOS 650D), all set up with the EF 70-210 lens. Both of these items are "vintage", being among the first of Canon's EOS type cameras, built in the mid-1980's. I was also trying out a budget drug store film, simply called Kodak Colour 200 - no "Super-Max" or super anything - it just costs less than other colour films, and I just wanted to see how well it worked. I found it to be quite under-stated, low on detail, and a bit "bloomy" when the colours get hot, so there you go. In most ways I suppose, it's like Kodak dug out one of their older formulations and set it off to China for manufacture. It's perfect if you're looking for a "vintage" film that you can buy cheap, not expired, today at any drug store... and perfect for a picture like this. There's absolutely no hint of "contemporary" in this picture. 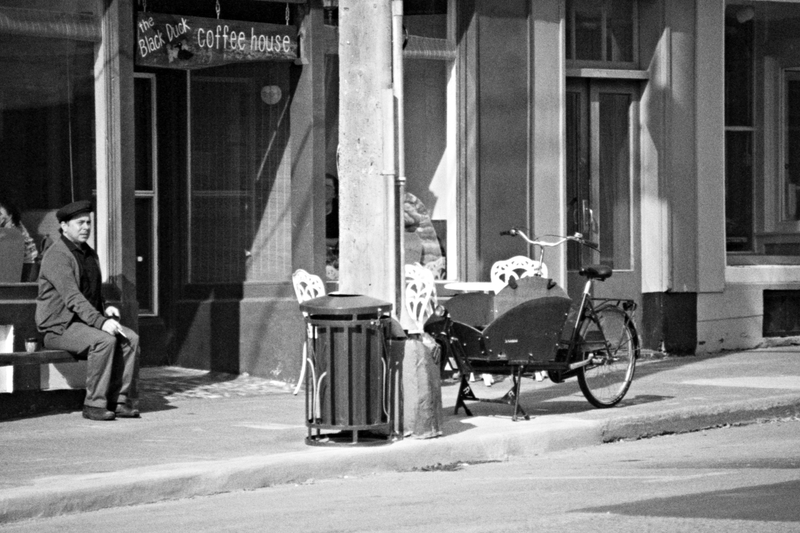 The store-fronts are all vintage Sackville, the guy is sitting on an old bench, dressed in a vintage suit and cap, smoking a cigarette, while his street-vendor cycle-thing awaits next to a trash can that could've come straight out of a Laurel and Hardy movie. And here, straight off my Scanner, without any artificial effect filters applied, the shot just looks right... it looks old. This works rather well too, but personally, I prefer the colour one. 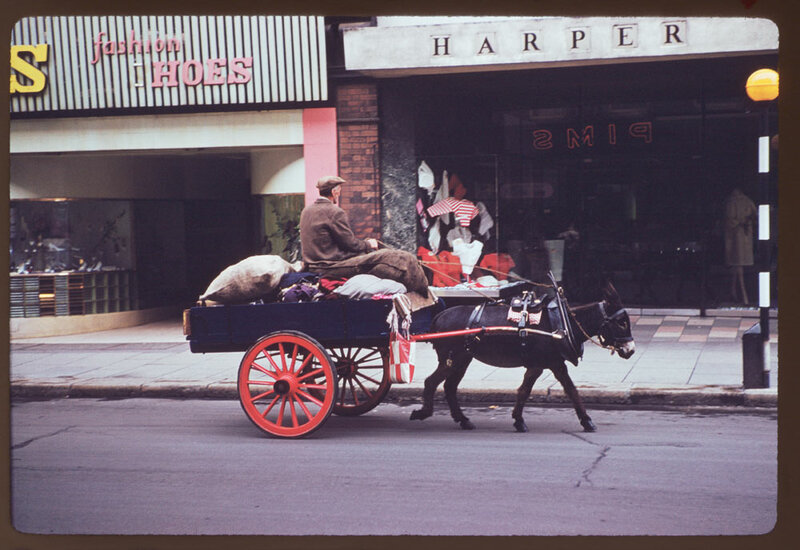 In colour, it resembles a Charles Cushman photo. It is admitted that Cushman was not the greatest at composition, and a lot of other important stuff, but what he did very well with his camera, was to document 30 years of life around the world, and was significantly, one of the early adopters of colour film. That's why I like the colour better - to me, it resembles a Cushman.